Bimetal thermometers read motion created by two dissimilar metal strips that change in length when the temperature rises. This reading is represented by a needle on an analog dial or by a digital measurement. Bimetal thermometers are economical and offer fair accuracy. They are available in a variety of mounting styles and can be mounted in vessels or pipes using pipe-thread mounts. Bimetal thermometers also can be user calibrated. 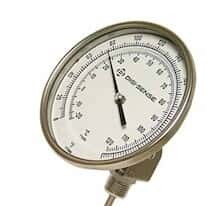 Typically, bimetal thermometers are used in industrial applications in which ease of viewing temperature is preferred.